Raise or Fold: A Year of Risky Business: So Soon? I reckon life is a bit like Nascar racing CG. If you never crash, you're not pushing your car anywhere near its potential. And if you don't win the race, you don't throw your arms up and retire - you put the car on the hoist and make improvements for next time. Card Girl, I wish you the best of luck and look foreward to anything you get published. I have really enjoyed your blog and check it every day. I believe you are better than the grinders that try to make an easy living playing poker. Thanks for the effort. Stay for the Poker Grump. Sounds like he needs a good friend. Which I believe he has found in you. And if you can afford to stay and at least be there for the Main Event, then do so. Your life right now may end up being the perfect time to throw caution to the wind and do it. GL either way. You only live once. Though the safe play is to move back home and only make Vegas a place for occasional jaunts and semi-extended pipe-dream persuits, you know you have what it takes. Vegas isn't a wasteland. It is certainly not the greenest place around, but a few miles outside of the morality carwash known as the Las Vegas Strip, there are normal cities and towns with parks, schools, and libraries, with normal people (for the most part). Vegas is what you make of it, and though many come out here with only a pipe dream of success, others truly have what it takes. I firmly believe you are one of those people. Take the life changing shot for at least a full year (or two). Perhaps it will be the place you spend the rest of your life. Perhaps you will curse the decision and take a greyhound back to DC in 2012. You never know until you try. Have a safe trip home. It was a pleasure to meet you and to see you around town. Take care, and good luck! Are the 2/5 games that profitable? There's no variance there? How many thousands did you net at the 2/5 games this past month LV Michael - five thousand? Ten thousand? Or more like five hundred - which is not enough to live on. I've lived in Vegas for years, and I've met maybe 5 guys who could actually play poker professionally. Out of hundreds. The rest are delusional. Mike G: Indeed. I've lived in Vegas off and on since 1974, and your assessment jibes with my observations. 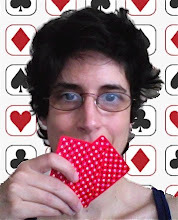 That's not to say Cardgrrl can't make a living playing poker professionally, but perhaps just not in Vegas. In my many years of experience, the most successful professional gamblers have been diligently anonymous nomads (of either gender) who shun Vegas, avoid well-known (if not all) tournaments, unequivocally love the game (poker, craps, blackjack), and remain indifferent to the winnings. A carry-on suitcase, an unrecognizable identity, no fixed abode, and an ATM card are the earmarks of pretty much every true gambler I've ever admired. If you've lived here for years, and only met five true professionals, you are either playing small or need to meet more people. Of course there is variance, as there is in any poker game. The question is whether or not you have the skill and bankroll to ride it out. I happen to think she does. Whether she does or doesn't cannot be decided by a one month jaunt. A proper sample size is necessary. Only she can make that decision. Until the shot is taken, you will never know.